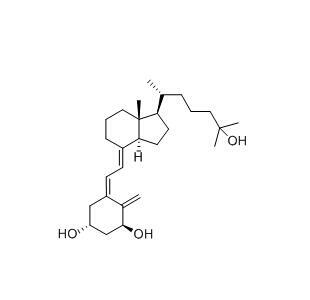 Calcitriol Cas number is 32222-06-3, has the chemical name of 1ALPHA, 25-DIHYDROXY-VITAMIN D8, It is the active form of vitamin D, also a hormone,has an important role in the regulation of serum calcium and phosphorus concentration, by increasing the intestinal Road calcium absorption in the blood to improve calcium levels, and can increase bone calcium release to improve serum calcium levels. The drug can be used in the clinical treatment of hypocalcemia, hypoparathyroidism (adult), osteomalacia, rickets (infant), chronic kidney disease, renal osteopathy, osteoporosis, prevention of glucocorticoid Induced osteoporosis. Calcitriol has the same effect as vitamin D3. Oral absorption is quickly, it reaches the peak within 3 to 6 hours. Looking for ideal VITAMIN D3 32222-06-3 Manufacturer & supplier ? We have a wide selection at great prices to help you get creative. All the Chemical Custom Synthesis of CAS 32222-06-3 are quality guaranteed. We are China Origin Factory of 1ALPHA 25-DIHYDROXY-VITAMIN D8 of 32222-06-3. If you have any question, please feel free to contact us.